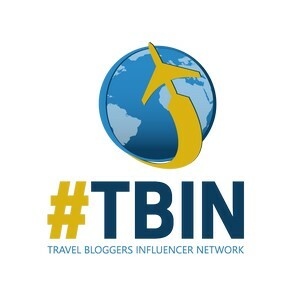 Have you ever travelled somewhere just for the food? Or found yourself drooling during a dining experience because the food was just that good? How about wishing you could wiggle your nose and have a favorite dish appear in front of you as you’re watching a movie? 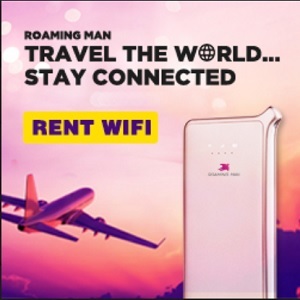 Well WJ has, and so have a few of our travel media friends. We asked for their input to share those foodie finds with you and here’s what makes us all drool. Leave it to the French to make a better burger. We ate this drool-worthy, double patty beauty at Le Pied de Mammouth in Strasbourg, France. 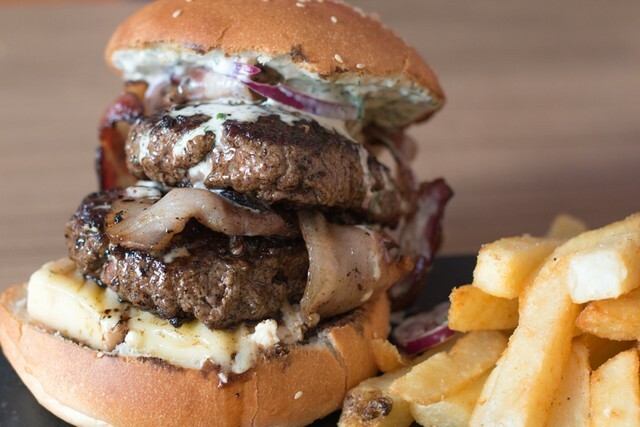 Loaded with a slab of cumin spiced Alsatian Munster cheese, smoked bacon and red onions and then topped with a creamy herb sauce, this pure beef burger, cooked ‘à point,’ was quite a mouthful. As Americans, we didn’t expect to eat hamburgers in France; however, we couldn’t say no to this one. As if this burger wasn’t enough, we added house fries and pints of locally brewed Bendorf beer to complete the meal. C’est manifique and worth every calorie! 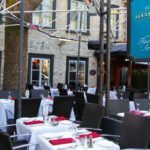 During a visit to Quebec City in the Canadian Province of Quebec, we dined at a European-style bistro named Le Clocher Penche Bistrot. Here we enjoyed a most divine dish – La Cocotte. 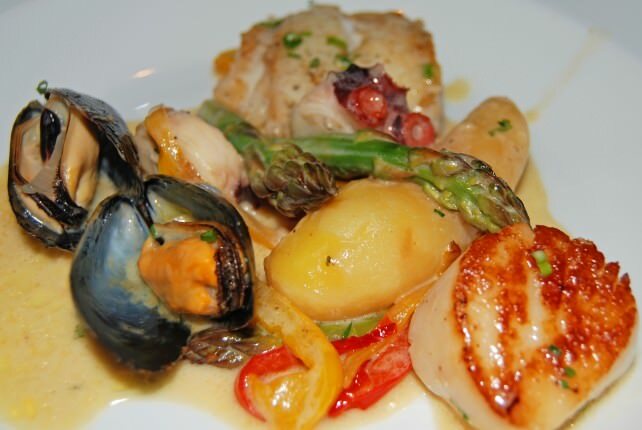 This is a fish and shellfish stew in a white wine and saffron broth. It was the most exquisite meal, and there was not a morsel left or a drop of broth wasted. This is a dish I would travel for. I don’t think I’d be exaggerating to say there is nothing quite so drool-worthy as a really good dish of mac and cheese. It’s comfort food. It warms your soul and delights your tummy. Jacob’s Pickles in New York City presented me with just such a dish. Actually, it was a cast iron skillet that arrived sizzling and bubbling. 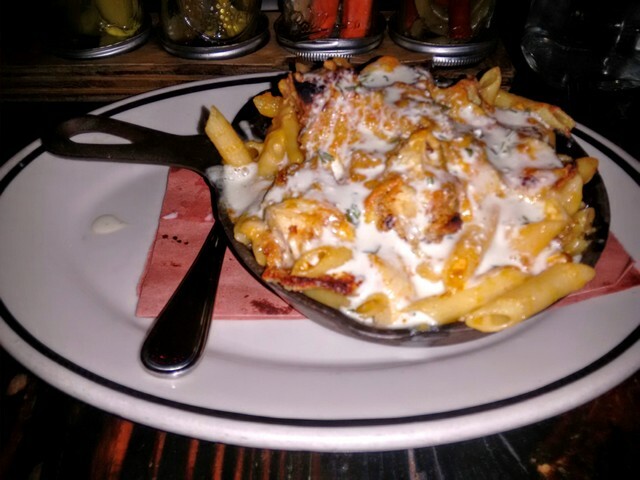 Think Buffalo Chicken Wings (without the skin or bones) complete with a blue cheese crumble sitting atop a mound of penne pasta literally smothered in cheese and you’ve got the essence of Jacob’s Pickles Buffalo Mac & Cheese. With the first bite – and every bite that followed – I knew I had chosen the best dish on the menu. And, although I left the restaurant stuffed beyond words, it was worth every single delicious bite. My favorite dish, the one that will have me hopping on a plane for 24 hours is dal makhani, with a side of paneer tikka and butter naan. In Mumbai, India there is a small hole in the wall restaurant that serves up the best North Indian dishes. Kareem’s will not pass any western food inspector’s tests, but the food served here will tantalize your tastebuds. The dal makhani served at Kareem’s is unlike anything I have eaten elsewhere. It is full of creamy goodness, an entire cupboard of spices like cloves, fennel, garam masala, chili’s and loaded down with urad lentils. It has an intense smokey flavor that is difficult to replicate anywhere else. 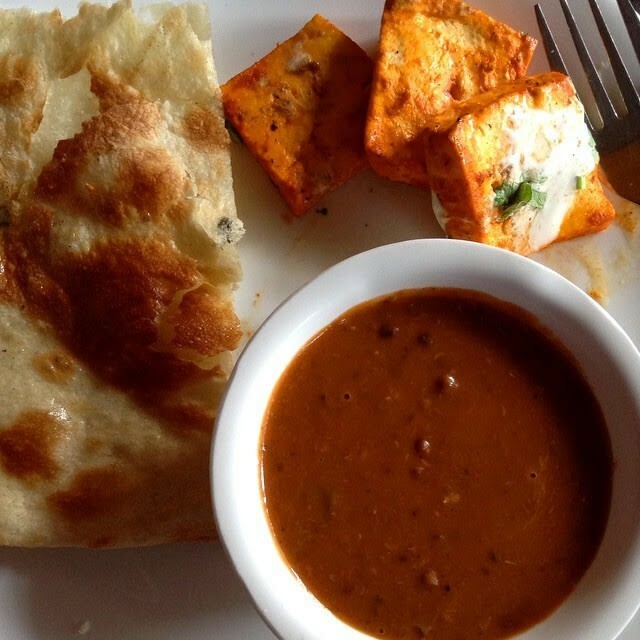 Eating the dal with perfectly charred paneer tikka and butter naan makes this dish absolutely drool worthy! We are not big meat eaters, but that changed when were driving from Key West to Miami. We were very hungry and saw this little restaurant in a strip mall in Islamorada called M.E.A.T. It had great online reviews so we decided to give it a try. 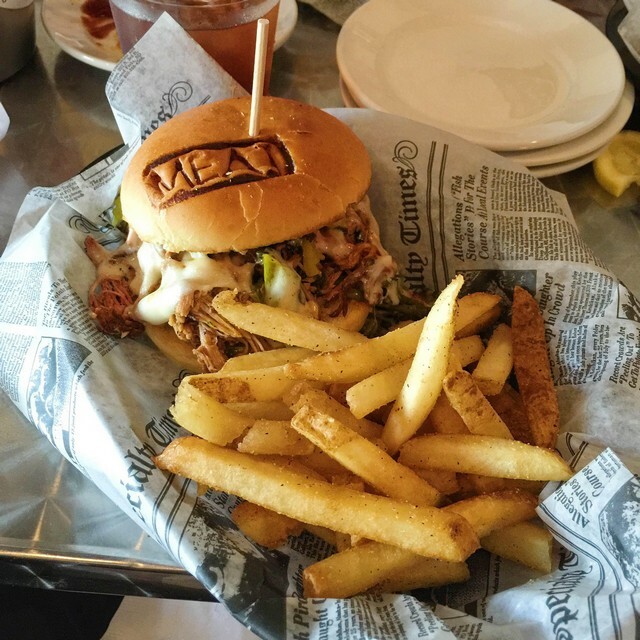 They are known for their burgers, but I ordered the Country Pulled Pork Sandwich and it was love at first bite. The sandwich consisted of 6 ounces of moist and smoky pulled pork topped with Provolone Cheese, Braised Broccoli Rabe and Banana Peppers. It was delicious! They serve all their burgers and sandwiches with a generous portion of Duck Fat Fried French Fries which were fantastic. The only disappointment was that we didn’t discover this amazing place until we were on our way out of the Keys! 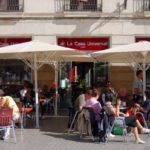 I love to eat local dishes whenever I travel to any new destinations around the world and always asks locals for what favorite dishes I should try when visiting their country. 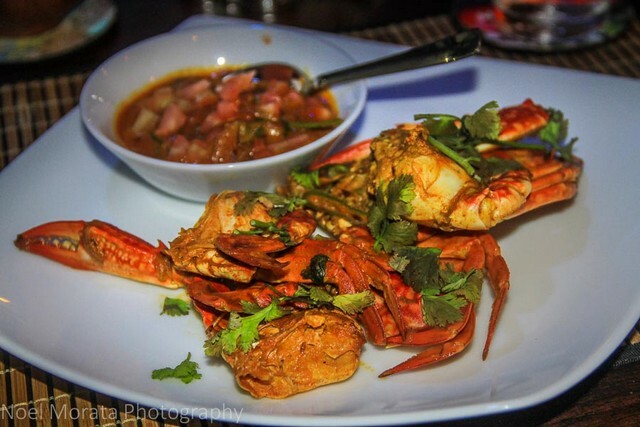 One of my favorite foods is crab and the spicy crab curry done in Sri Lanka really is amazing! Full of flavors and a variety of spices that make your mouth explode, this is definitely one of my favorite dishes. Check out some of my other favorite dishes of Sri Lanka with my top must try Sri Lanka dishes here. 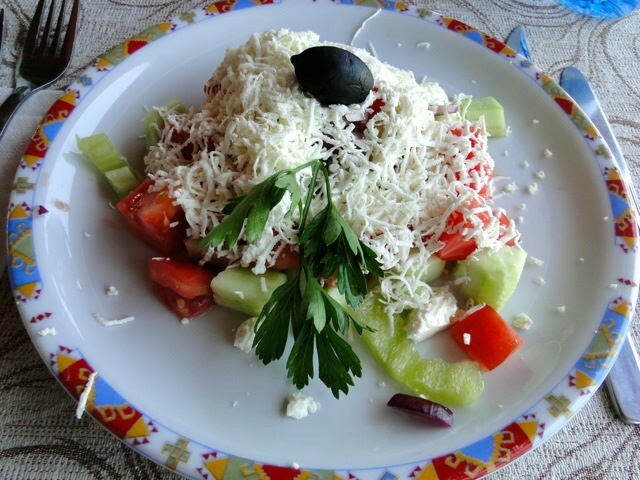 The shopska salad from Bulgaria- I was in love with Greek salads until I discovered the Shopska salad in Bulgaria. Similar in ingredients, the fresh & juicy tomatoes, peppers, onions, and cucumbers are better here than anywhere in the world! Top it with some crumbled cheese and the combination will make your mouth sing! 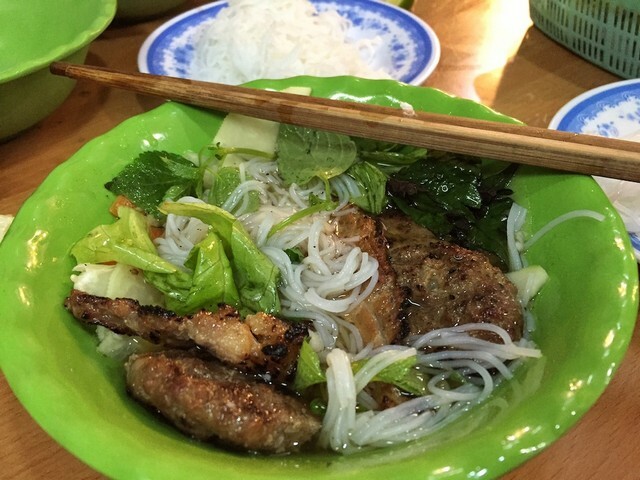 One dish that had me drooling is Bun Cha in Hanoi, Vietnam. This is one of Hanoi’s most famous street food dishes, and you can spot a Bun Cha restaurant by the smoking barbecues out front. This drool-worthy tangy noodle soup is piled high with white rice noodles, fresh herbs, lettuce and chillies, but what really makes this dish is the pork patties, which have been grilled over hot coals until they are almost caramelized, resulting in a sweet smoky flavor that is insanely delicious. Vinegar from pickled vegetables in the soup help to cut through fattiness of the pork, while the lettuce and herbs add freshness to the dish. 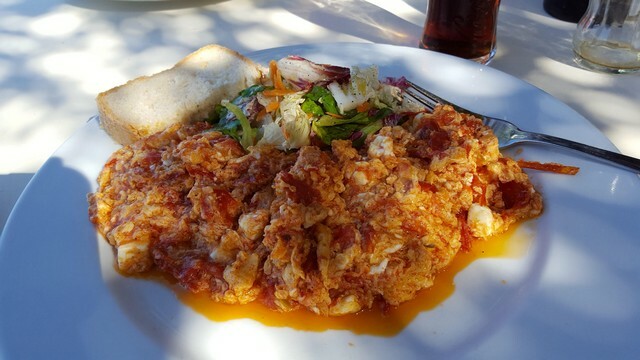 Strapatsada is an amazing breakfast dish we had in Greece. Call it senses-awakening, life-changing and certainly drool-inducing. Just don’t call me late for breakfast when this is on the menu. The recipe is fairly straightforward and completely Greek: eggs, slow-cooked tomatoes, onions, feta and copious amounts of olive oil. It’s cooked in a single skillet until the scrambled eggs are fluffy and hot. It’s served with thick slices of crusty bread, which perfectly sop up any leftover sauce. We’ve tried to recreate this one at home, cutting back a little on the oil and cheese, and using egg whites rather than whole eggs, but it’s just not the same. Go all out, with all the fat, all the calories, all the deliciousness. 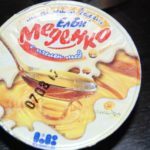 Any time we eat it, we picture ourselves sitting seaside in Mykonos, enjoying a lazy breakfast while tourists buzz by on four-wheelers. 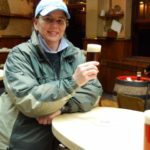 I recently visited the historic city of York, UK during the annual Food and Drink Festival. 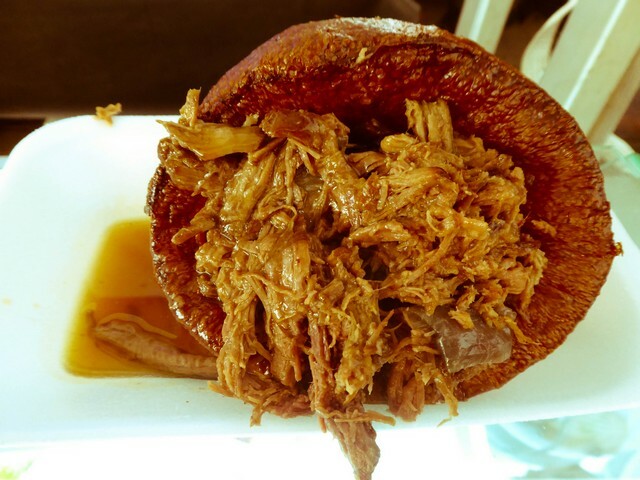 I had one of the best Yorkshire puddings with slow cooked beef and gravy, that I have ever had. I later discovered after talking to some tourists that some people outside of the UK don’t know what a Yorkshire pudding is, well their definitely missing out as its one of my favourite things. It’s a batter pudding traditionally had with a Sunday Roast Beef dinner. We use the same recipe for pancakes or crepes which are more commonly known around the globe. Such a simple dish made from eggs, flour and milk or water but can be tricky to get the hang off when cooking, mine often come out flat as a pancake rather than light and airy as they are supposed to be. They were originally served as a first course to fill you up as they are made from low cost ingredient and the roast dinner could be costly. A Sunday roast isn’t complete without a yorkie! 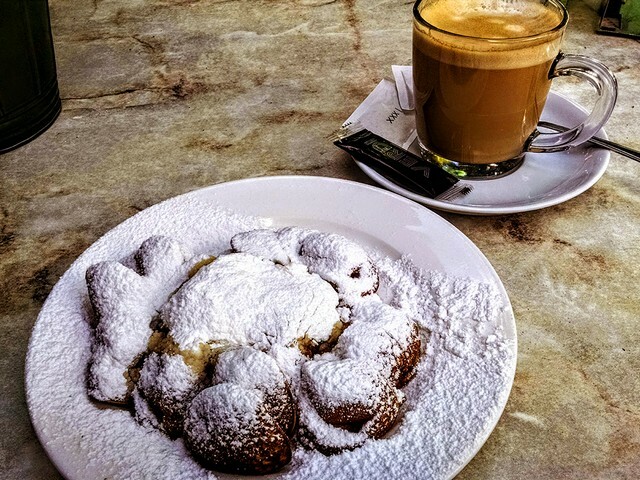 Poffertjes — the very word has me salivating and picturing myself in a canal-side Amsterdam café. These dreamy little darlings are a Dutch tradition that goes back centuries. The first published recipe showed up in a mid-1700s cookbook. Pronouced POH-fur-tyas, these small, fluffy pancakes were originally made simply with buckwheat flour, water and yeast. Since buckwheat grows well in poor soil, they were thought of poor man’s food. Today’s recipe more commonly uses milk for the liquid and adds eggs. Still important for authenticity is the buckwheat flour and yeast, which gives them their puffiness. Poffertjes are baked in a special pan, like a griddle with round cavities in it. At Christmas markets and summer festivals, poffertjes stands pop up all over the place. It’s fun to watch the cooking process: Pour in the batter, cook till the edges are crispy, turn with a special two-pronged fork, wait another minute, then serve up to the waiting hordes. 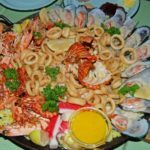 You might need some friends to share the mouth-watering seafood platter at Die Walskipper Restaurant in Jeffreys Bay, South Africa. 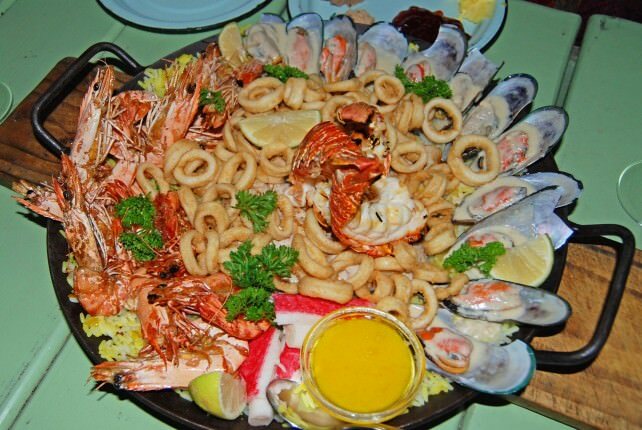 Accompanied by melted garlic butter, the seafood pan for three is an enormous platter of the freshest and most delicious seafood we have ever tasted. 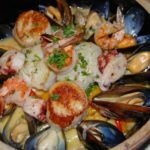 Mounds of crayfish, calamari, mussels, prawns, linefish and crabsticks served over a bed of rice were more than four of us could devour – even though we tried our hardest. Now it’s your turn to tell us what foods make your drool. You know the drill… Send us an email or post on our Facebook page and let us know – we’d love to share your foodie finds, too.